Citation Information: JCI Insight. 2017;2(15):e94821. https://doi.org/10.1172/jci.insight.94821. The chemokine receptor CCR6 marks subsets of T cells and innate lymphoid cells that produce IL-17 and IL-22, and as such may play a role in the recruitment of these cells to certain inflammatory sites. However, the precise role of CCR6 has been controversial, in part because no effective monoclonal antibody (mAb) inhibitors against this receptor exist for use in mouse models of inflammation. We circumvented this problem using transgenic mice expressing human CCR6 (hCCR6) under control of its native promoter (hCCR6-Tg/mCCR6–/–). We also developed a fully humanized mAb against hCCR6 with antagonistic activity. The expression pattern of hCCR6 in hCCR6-Tg/mCCR6–/– mice was consistent with the pattern observed in humans. In mouse models of experimental autoimmune encephalomyelitis (EAE) and psoriasis, treatment with anti-hCCR6 mAb was remarkably effective in both preventive and therapeutic regimens. For instance, in the imiquimod model of psoriasis, anti-CCR6 completely abolished all signs of inflammation. Moreover, anti-hCCR6 attenuated clinical symptoms of myelin oligodendrocyte glycoprotein–induced (MOG-induced) EAE and reduced infiltration of inflammatory cells in the central nervous system. CCR6 plays a critical role in Th17 type inflammatory reactions, and CCR6 inhibition may offer an alternative approach for the treatment of these lesions. Characterization and engineering of anti-CCR6 mAb. mAbs 6H12 (A) and 29A6 (B) staining of various L1.2 transfectants. Stable L1.2 transfectants expressing either human CCR6 (hCCR6), mouse CCR6 (mCCR6), hCCR5, hCCR7, hCCR8, or hCCR9 were stained with the anti-hCCR6 mAbs 6H12 and 29A6. (C) A 3-color staining protocol was used to assess for expression of CCR6 (horizontal axis) on human T cells (CD3+/CD4+) using 6H12 FITC-conjugated mAb. (D) Binding of both 6H12 and 29A6 mAbs to human CD19+ cells was determined by preincubating cells with 30 μg/ml purified 6H12 (block) followed by staining with 1 μg/ml 29A6-FITC. (E) Mapping of 6H12 (gray bars) and 29A6 (black bars) binding sites on human CCR6 N-terminal region by peptide ELISA. (F) Comparison of humanized 6H12 (h6H12) versus mouse 6H12 (m6H12) by flow cytometry. EC50 of h6H12 and m6H12 was measured by flow cytometry on hCCR6 L1.2 cells using increasing concentrations of purified mAbs. (G) Inhibition of hCCL20-mediated chemotaxis by anti-hCCR6 mAbs. 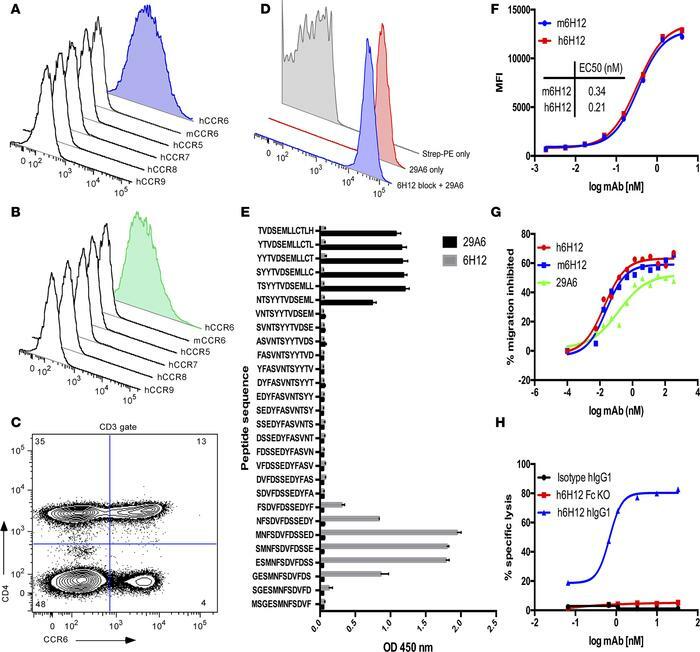 Assessment of hCCR6 L1.2 cell chemotactic response to 120 nM CCL20 was carried out in the presence of increasing concentrations of purified anti-CCR6 mAbs. The percentage of total chemotaxis was calculated using the number of cells migrated in the absence of mAb as 100%. (H) Cytotoxicity of activated human NK cells (effector) against hCCR6 L1.2 cells (target) by mAbs in vitro. Dose-response relationship was obtained using increasing amounts of h6H12 IgG1 (blue curve), h6H12 Fc-KO (red curve), or hIgG1 isotype control (black curve) and a constant effector/target cell ratio of 2:1.